Shlomo Aloni is a respected aviation historian based in Israel. This is his second volume for Osprey, and hopefully not his last. One of my favourite subjects is Israeli fighter and bomber aircraft and in particular Mirages, Neshers, and Kfirs as I had spent 7 years working on the Mirage in the RAAF. 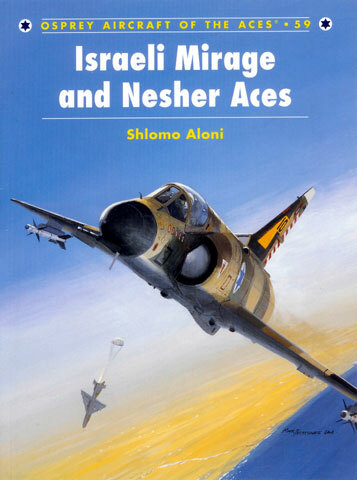 This new book covers the troublesome early acquisition days and how the Israeli pilots quickly adapted to the speed and lack of manoeuvrability that was inherent with the Mirage. It also details the problems with both the Cyrano radar and Matra 530 missile system and how the Israelis found solutions to remedy the shortfalls. There is some very in depth details on both the 6 day war and the Yom Kippur war and some accounts from sorties flown by particular pilots. One thing that amazes me is the amount of Defa cannon kills with the gun sight that was fitted. I can remember performing a gun sight harmonisation one day and finding the reticle to be many milirads out the next, such was the stability of the electronics in the gun sight control box. The moving reticle is controlled by electrically induced torque applied through the electrical control coils of the gun sight gyro. Also having flown as a back seat passenger in a Mirage IIID in a ground controlled intercept on another Mirage, I have a bit of an understanding of the difficulty of a gun kill, particularly when you only have about 150 rounds per gun. Some very clear gun camera stills have been included showing some dramatic destruction of opposing aircraft. There are plenty of in service photographs including some up close detail shots. At least 36 side profiles and colour schemes and a double page containing 22 nose markings. One page contains 3 original colour photos. An annexe contains a list of all the Israeli aces and all the details of each kill. I thoroughly recommend this book to any modeler building Israeli Mirages, or anyone who is interested in that piece of Middle East history.